How did Surviving in Numbers get its start? Surviving in Numbers, Inc. is a 501(c)(3) non-profit organization. Surviving in Numbers began in October of 2012 and launched online in April 2013, initially conceived of as a way to showcase the prevalence of sexual violence on campuses across the United States. 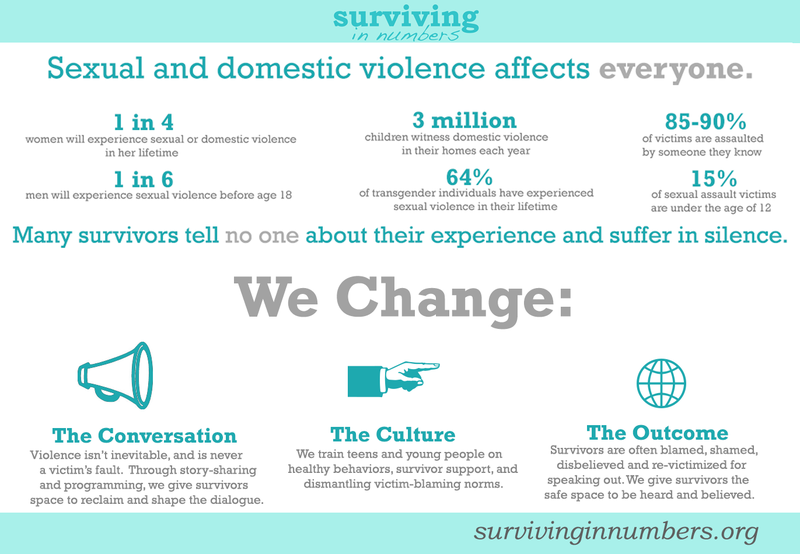 At its start, Surviving in Numbers was a small project for 4 campuses within Massachusetts, but has since grown organically and rapidly, speaking to a prior lack of space for survivors to be able to share stories anonymously and without fear of judgment, stigma, or shame. Online, Surviving in Numbers posts stories from survivors of many ages and backgrounds — not just survivors who’ve experienced violence on campus. Offline, Surviving in Numbers develops & implements prevention curriculum for teens.